Rotates from 45 degrees to 315 degrees. There are few things more difficult than holding pieces of a project at odd angles while trying to assemble with a nail or screw. 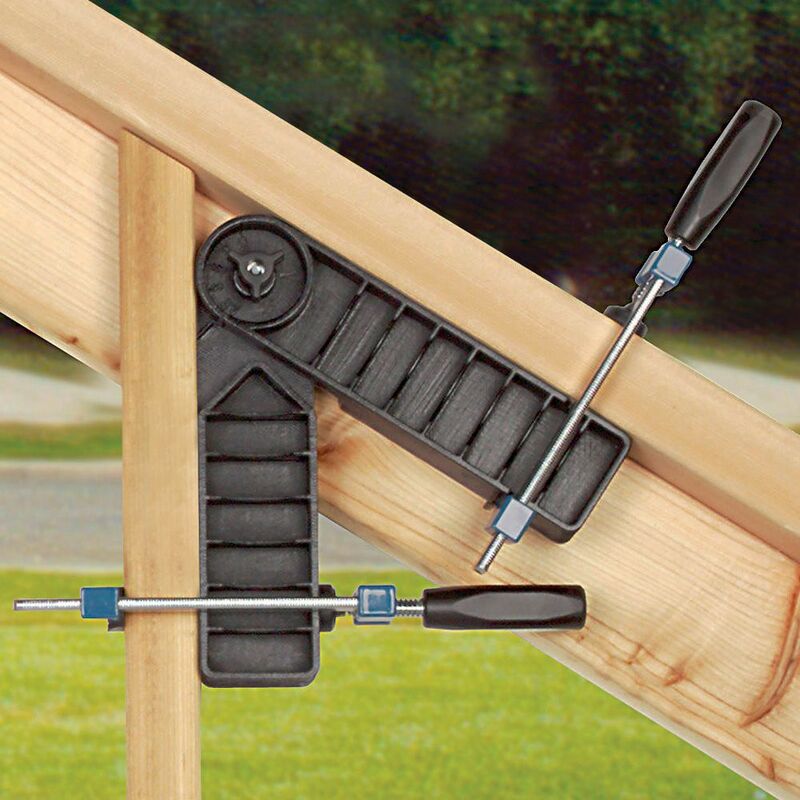 The Adjustable Clamp-It rotates from 45º to 315° and locks in place at the angles you'll need most! Works with any joinery technique. 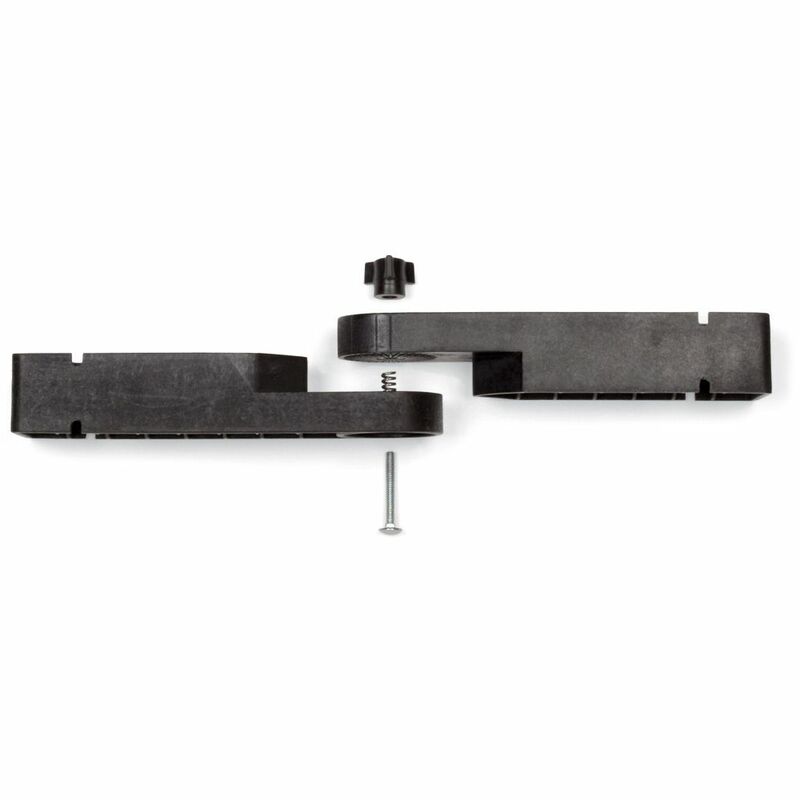 Easily assemble pedestal bases, staircases, decks, cabinets, drawers and more without custom clamping jigs! 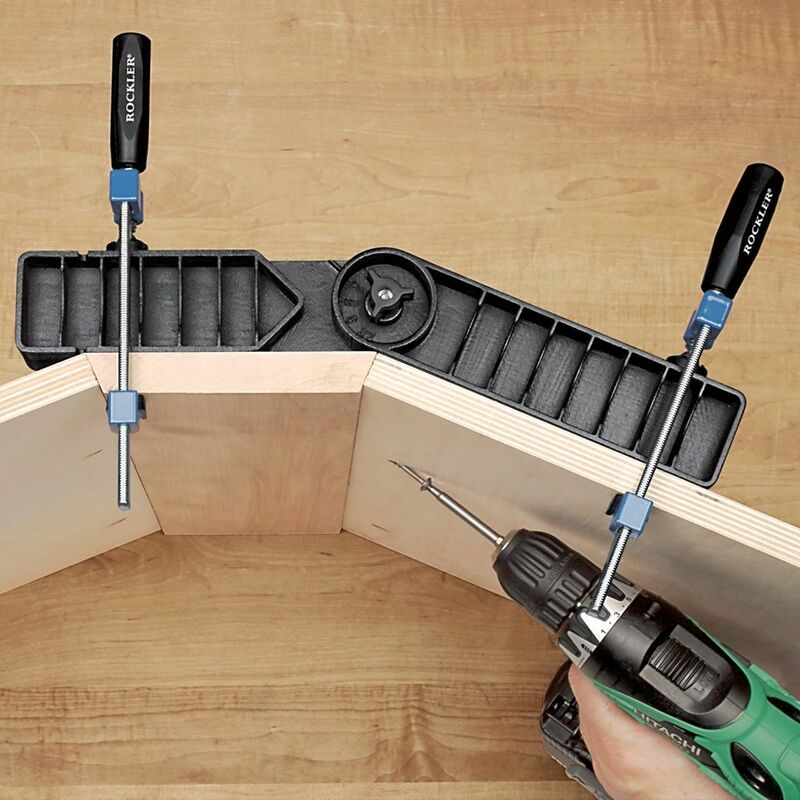 Replaces custom clamping jigs, acts as a third hand, and eliminates the need for long clamps. Measures 8" x 8" x 1-1/2". Clamp it and fasten it at 90 degree and multiple angles. Manufactured from high-impact, rigid polycarbonate to ensure strength and accuracy. 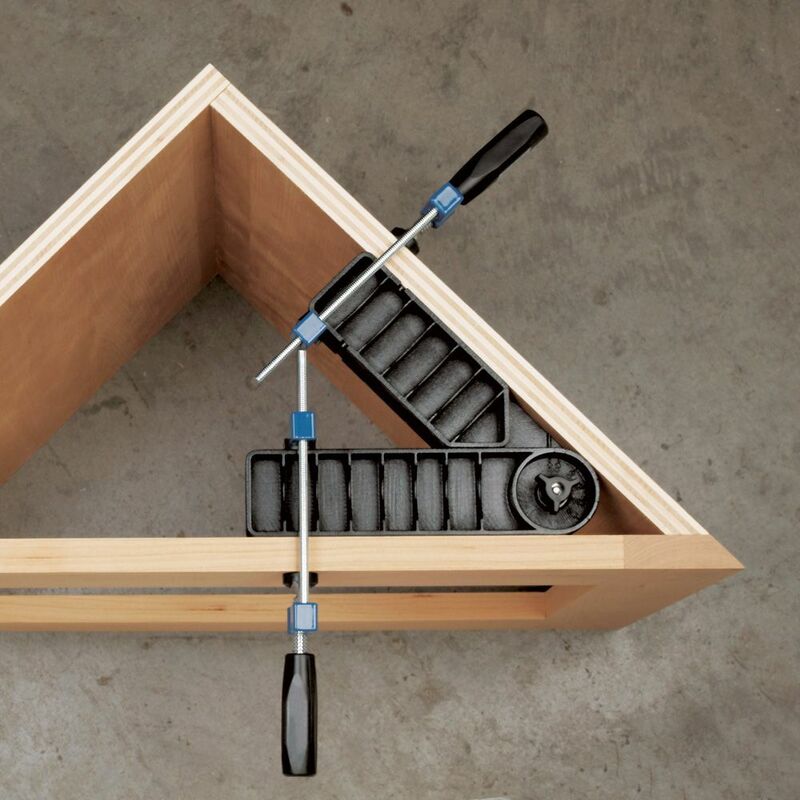 Clamp and fasten projects with odd angles or typical 4-, 6-, 8- and 12-sided frames. Knob twists for tightening and loosening, while interlocking teeth securely set angle. Works as expected. No issues this far. Very handy tool when working with angled pieces. It should work out well for a number of uses. The most versatile tool to come along in a long time. Rockler is ahead of the curve. Just got this tool. Anticipate using this on many occasions. Great tool to speed production. Wish I had bought another. The adjustment makes it easy to lay flat in my job boxes. Perfect for moving from job to job. If you want to make it square, you need to get a set of theses clamps. Easy to use and high quality. I have not had a chance to use them yet. However, they seem to be great quality as are the fixed ones I have. 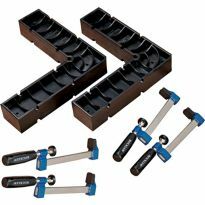 Rockler adjustable square is a great addition to my tool inventory. I like the flexibly of locking in different angles. Does the job is was made for. I will definitely use this ! 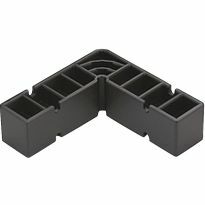 Works great for building flag cases. Rather thank make custom angle gluing crawls, I use this to make flag cases for Boy Scout flags. This works great and hangs out of the way on my tool board when not in use. Worked great. Like having another set of hands to hold parts in place during dry fit. Using this assembly square provides stability to your project. It's almost like having another pair of hands to hold your pieces together. I used it to hold the plywood that I wanted to join together. So easy to use and adjust. Do not have to clamp and unclamp product to align each side. Clamp to table, align both sides, and clamp for assembly, done. Easier done than said! It makes joining two sides so much easier because you can select any angle and clamp both sides before securely screwing the sides together to form the perfect angle. Great product. Would have been helpful for description to identify the degrees or settings for tightening. Very handy tool. Keeps everything square. Allow you to support any angle! Not everything is a right angle in woodworking. These support all the other angles you may encounter. Everything is not 90 degrees and this allows for many angles and, like the rigid one, makes it easy to clamp parts during assembly. I opened the box as soon as it arrived. Examined the Clamp-It and the clamps. Everything looked good and easy to use. But... With 20 inches of snow in the ground and temps near zero and no heat in my shop - I have not had an opportunity to use them. I know they will be a great help when I start building a Hope Chest for each of my 7 granddaughters. It makes so nice to be able to clamp two pieces together and have your hands free to glue and nail them together. Good Product For Price. As Advertised. Very useful product for the price . I am not disappointed. A must to have for all woodworkers. I needed to make a thin octagonal frame wherein the angles cut by the miter saw could not be relied on for gluing alignment. This tool was PERFECT for that job. I glued four pieces together for one half and four pieces together for the other half. When I put the two halves together, the alignment EXACT. Right after I ordered two of these things, I saw a cheap knock-off in one of the stores, that looked almost the same. I was not impressed at all - flimsy construction, and way too much play in the joint. So, I was a bit afraid that these would be of similar quality. Not at all! 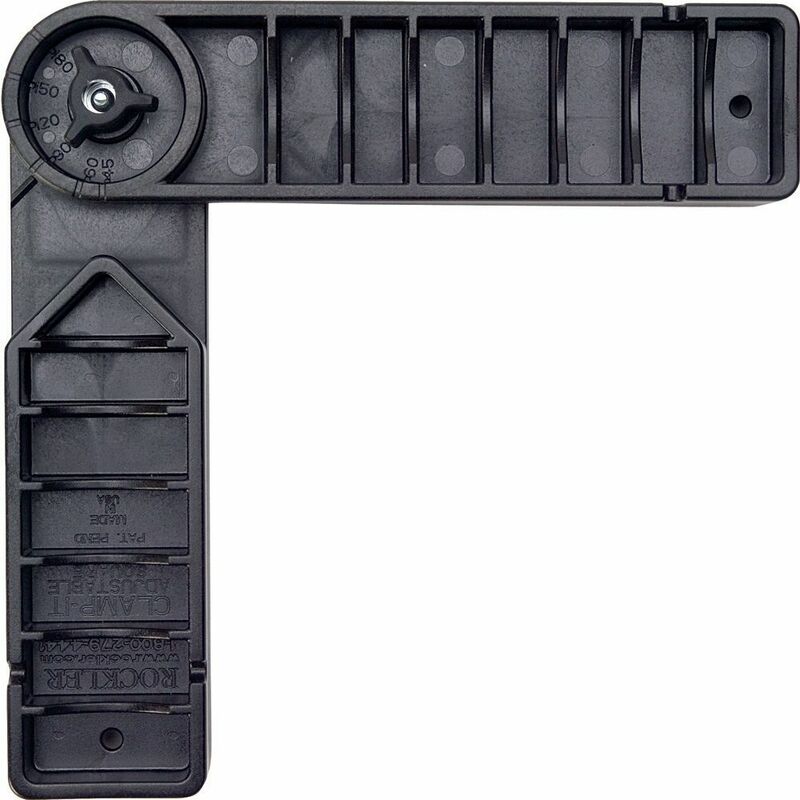 The product is excellent - rock-solid, very sturdy, positively locks at any angle. I checked them with a digital protractor, and they are both slightly off by 0.3 deg. For this kind of tool, I honestly think this is totally negligible. I have some home-made assembly squares made of plywood that are serving me well. But this tool is a very nice addition to the toolbox, as it is adjustable. 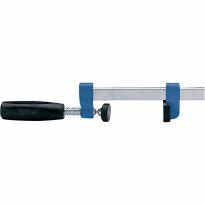 Another well made and very useful product from Rockler, most definitely recommended! And 50% discount made it even better. I bought two of the Adjustable Clamp-It forms to help with a 4 sided corner cabinet I was building. Setting the angle and clamping (135 degrees) allowed me to clamp up and hold the sides while fitting internal shelves and finishing the assembly. 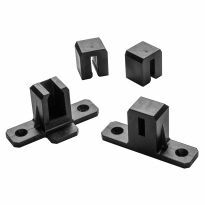 The clamps are large & sturdy enough to hold large cabinet pieces in place and are a great match with the Clamp-It Assembly Square (90 degree corner). Definitely a shop asset! Works great. Thanks Rockler for carrying excellent, quality products. What a cool tool. 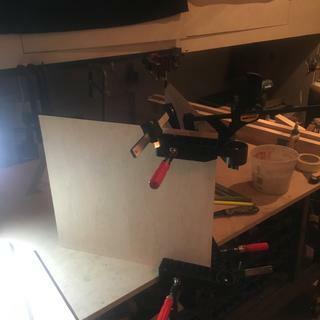 I initially bought a couple of clamps and the 90 Clamp it a few years ago, then bought more clamps and the adjustable angle Clamp it and it makes assembly much easier and far more accurate. 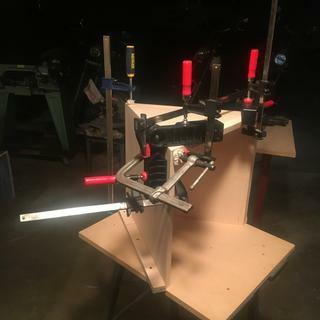 My dry fits and assembly go together more square and the multiple angles saves a ton of time and effort on making custom clamping blocks.It seemed a bit pricey at first but the first time I used it - along with the 90 Clamp it, I was convinced I didn't pay enough. A very usefull product, versitile, and literally a third hand, simple to set up and use. A wood workers aid needed aid to complete any project. I'll be the first to admit I thought I spent way too much money on this but now I want more than the two I got. These are amazing and what a problem solver. Highly recommended! Much sturdier than I expected. 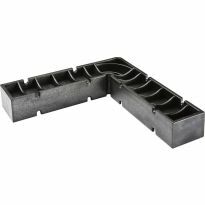 I have been using these to build an entertainment center than contains both 45 and 90 degree angles, and these have been extremely helpful. Works great with my pocket hole jig. This a versatile, sturdy clamp. It locks down in any of it's preset positions. The beams are wide, well formed and have slots for clamps to help avoid slippage (slots are narrow and require companion clamps or narrow rails like Irwin Quick-Grips). 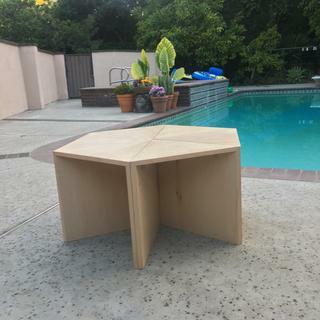 Making bins to fit oddly angled cabinets, this looks like it will help. Bought the smaller versions non adjustable and really enjoying them. Sale this one on sale and wanted to add to my collection. I hope this is easy way to find angles. I'm not very good with geometry. I have the 90 degree square already and thought that this would provide additional options. Husband asked me to order. 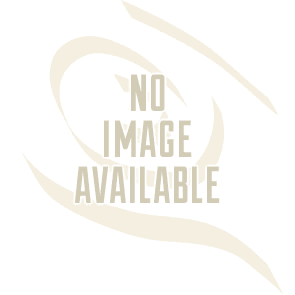 Has personal woodworking shop. Uses various sizes of clamps. 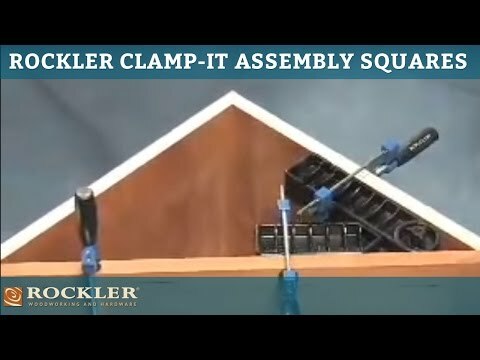 I need corner clamps with adjustable angles for boxes with 5 or more sides. To assembly my wood projects. To set up projects faster and too make my life easier. Was ging t make clamps but this will be better and faster and adjustable to boot! I have a use for angles other than 90. Always have need for a clamp - - especially nice that it is flexible. 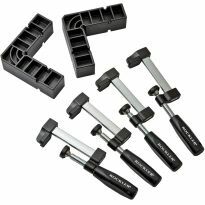 Great for holding and gluing up PVC exterior mouldings. To hold projects during glue up. I make a lot of bookcases. I think this will be great to help me line up the shelves. Just looks like a great idea! Always struggle with getting the angle right. This should be very helpful. Tried out this adjustable assembly square and liked it. Want to get a couple more. It looked useful and it made my order large enough to qualify for free shipping. to hold two handrail pieces to be fastened with glue and screw. I will use it on a 22 1/2 degree angle. Seen one in action. So had to have. Because it's a genius idea. already have one - thought 2 would be good decision. 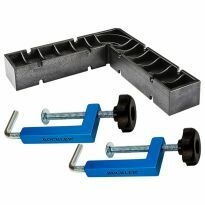 Can these adjustable Clamp its, be used with and attached to the Clamp-it corner clamping jig!? Does it come with the two clamps as depicted in the photo ? We also bought non-adjustable squares that had clamps included. However the adjustable one did not have clamps included. Note that any clamps of appropriate size will work. Hope this helps you. This comes as 1 pc. The picture showing 2 was a picture of an application. I needed 2 so I ordered 2. I hope this helps. Can't figure out what Clamp-It square to order for putting drawers back togeter? BEST ANSWER: I didn't remember that there were multiple sizes, but whichever will fit will work great. The last project I did with mine was to build an octagonal frame. It turned out great. I've used mine both inside a frame and outside a frame. A lot depends on the size of the drawer -there are standard size clamps and mini ones as well. But at least for the drawer face they offer a clamp set specifically for that-sorry I can't remember the specific title of that clamp set though. I would say any of them as long as they fit into the drawers. Is there an angle guage on this so i can set a specific angle? BEST ANSWER: Yes. 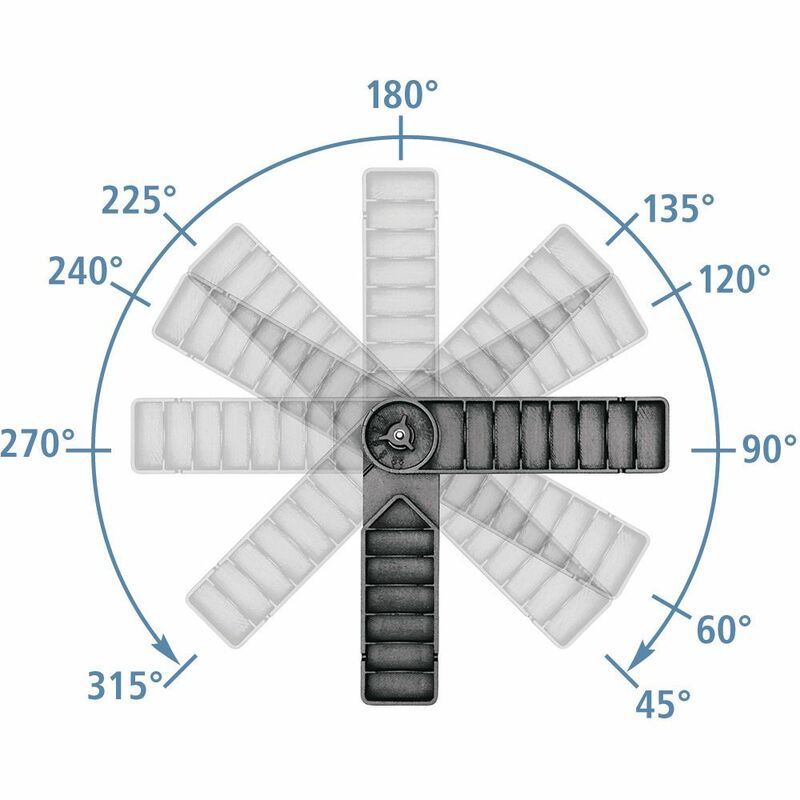 It's embossed labels allow you to identify and select any angle from 45 to 180 degrees. The rotating joint is also notched to help you predictably lock your preferred angle in 1 degree increments. Please excuse my typo. The notched joint helps to set angles in 5 degree increments (not 1). As you adjust it, will it have a notch to indicate that you reached 90 and/or 45 degrees? Will the f style clamps work with these? BEST ANSWER: Yes, with these cautions. Be sure that the throat depth of the clamp is sufficient to position the adjustable assembly square to allow fastening. And be sure that the bar length of the clamp will accommodate the combined thicknesses of the assembly square and the material being fastened. Or do you have a clamp that you recommend? Can I set 22.5 degrees on this clamp?